It seems like a simple thing, but it is surprising how many times people leave page numbers off long documents. This is particularly common in large PDF files that have been created by merging multiple documents from different sources. If you have ever been frustrated by one of these monster PDFs, especially after printing it and trying to keep the pages in the correct order, then you’ll love this little piece of free software. 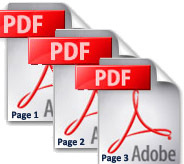 The A-PDF Number tool is a nifty freeware application that does one thing and one thing only– it puts numbers at the bottom of pages in PDF files. The free version enables you to choose the starting page for numbering and the ending page, as well as the number to start with, the type of number you’d like to use (numeral, capital Roman, lower case Roman), a prefix (such as “Page”), position (bottom-left, center, right), and text color. You simply choose the file you want to convert, and the program uses your configuration settings to save a new version with page numbering. A-PDF Number supports Adobe 5.0 and higher PDF files and you do not need to have Acrobat installed to use it– any PDF reader will do. Note that the program does not analyze content on the pages prior to placing page numbers, so if your PDF has content very close to the bottom of the page, the page numbers will be placed on top of it. There is a $35 “Pro” version that provides more functionality and control over number placement and style, but for most purposes the free tool will suffice. As a small business owner, the last thing you need is little annoyances like a pile of unnumbered pages to sort through. Use the free A-PDF Number to take at least one little hassle out of your day.